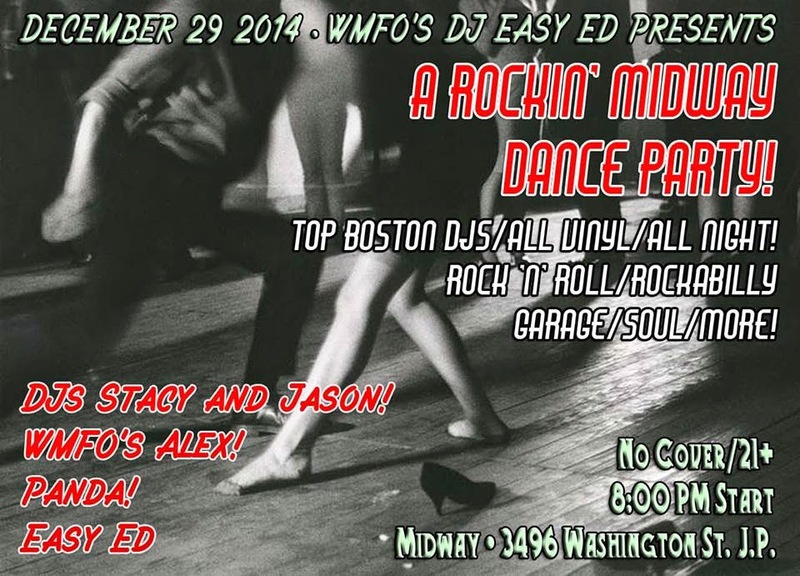 December 29, 2014: Midway Dance Party: DJ Easy Ed and Special Guest DJs Spin 45s All Night! Friends of the Midway, vinyl lovers, music lovers, dancers, romancers, and anyone looking for something fun to do between Christmas and the New Year--Come on out to this free Midway holiday party, with music provided by some of Boston's top rockin' 45 fanatics. Get your friends together for a moovin', groovin' good time at Boston's coolest venue. See you there! Spinning the platters . . .
Jason Thornton and Stacy Shreffler have been packing dance floors all over the country with their mind-blowing collection of soul and rock ‘n’ roll 45s. They currently host a regular night at Abigail’s in Cambridge. DJ Panda hosts regular nights at River Gods and Abigail’s. The kids love him, and we love him! He’ll be adding a little bit of ska and punk to the mix, as well as 50s R&B and rock ‘n’ roll. Alex Piandes—of “Coffee and Smokes” fame—currently hosts “The Desperate Hours” on WMFO in Medford. He’s got the garage and rock ‘n’ roll platters that matter! Easy Ed is the man behind “Easy Ed’s Variety Hour” on WMFO in Medford, MA (airing alternate Fridays from 6:00 to 8:00 PM Eastern—see www.easy-ed.net for details), spinning rockabilly, hillbilly, and ‘50s and early ‘60s rock ‘n’ roll and R&B. He also hosts the Primitive Sounds DJ night at River Gods in Cambridge, MA; spins records live at other clubs; and promotes rockabilly and rock ‘n’ roll events throughout the Boston area. He specializes in dance-friendly 45s for folks who love to move their feet. December 20, 2014: Jittery Jack, with Bloodshot Bill and Easy Ed's Record Hop! 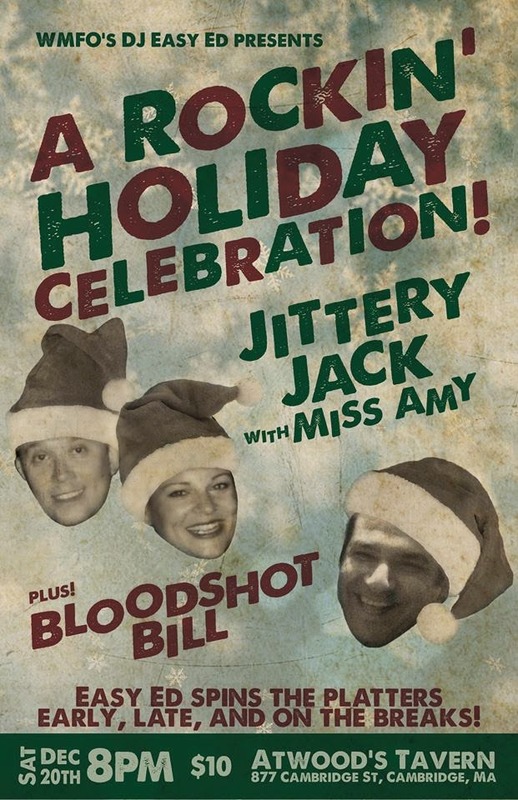 Jittery Jack with Miss Amy Griffin and Bloodshot Bill! A Rockin' Holiday celebration. Be sure to pick up a copy of Jittery Jack's new 45 "Something Wicked This Way Comes" and Bloodshot Bills "Stuffin' Her Stocking" at the show! Easy Ed spins the platters early, late, and on the breaks. See the Facebook event page for details and advance ticket information. December 10, 2014: Easy Ed and P.J. 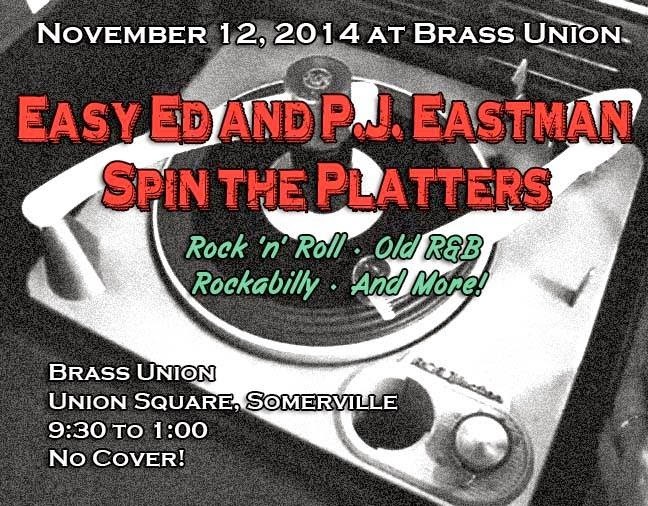 Eastman Spin the Platters at Brass Union! We had such a great time last month at Brass Union, and we're gonna do it again in December! Join WMFO DJs Easy Ed and P.J. 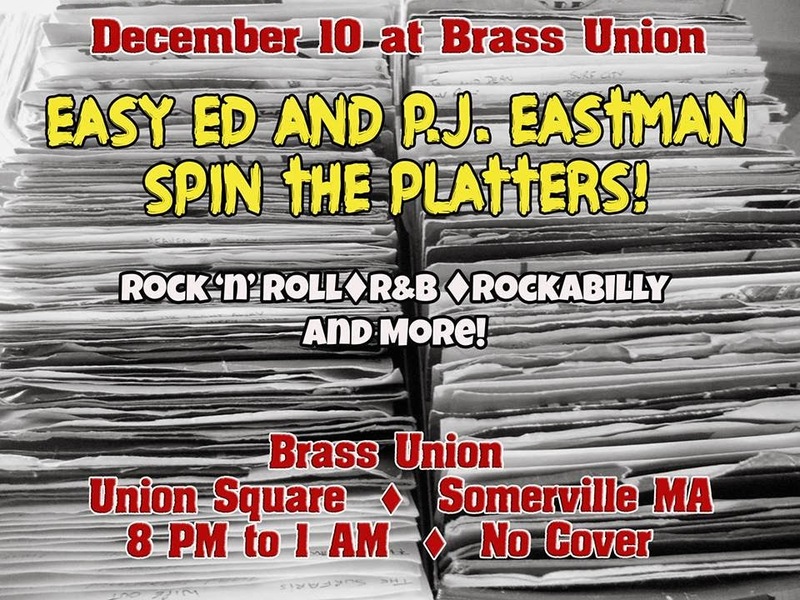 Eastman for a fun lil' platter party at Brass Union in Union Square, Somerville (formerly Precinct). They'll have their best records lined up for your listening and dancing pleasure. Vintage rock 'n' roll and R&B, blues, soul, exotic instros, movers, groovers,, and shakers. Brass Union is a very cool venue with excellent food and drinks, as well as games and a dance floor. See you there! 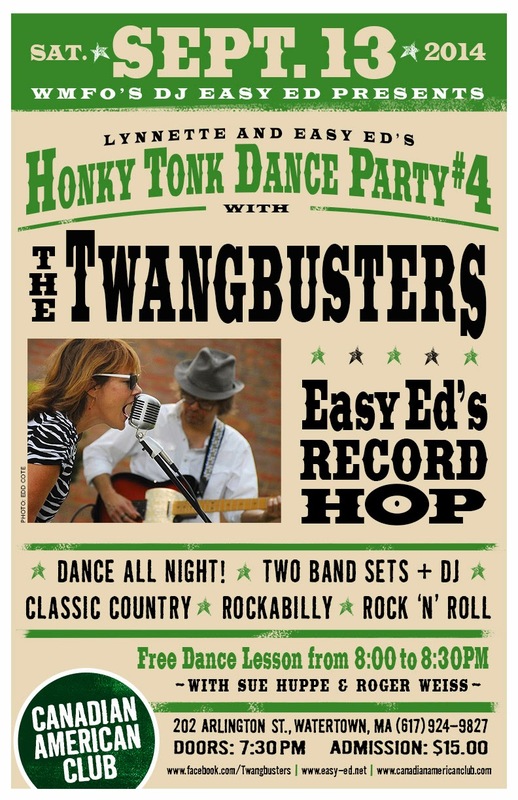 I hope to see you this Saturday night at the Canadian-American Club in Watertown, MA, for Lynnette and Easy Ed's Honky Tonk Dance Party #4, featuring The Twangbusters, a free dance lesson with Sue and Roger, and DJ sets by WMFO's DJ Easy Ed. Read on for details, and thanks! This dance series started out strong and just keeps getting better and better. Be sure to catch our next one on September 13 and dance the night away with the Twangbusters, with DJ Easy Ed playing music throughout the night whenever the band isn't playing. Once again we’ll be offering a free dance lesson early in the evening. Swingin' boogie, blues, and bop, with a heapin' helpin' of twang and sass, the TWANGBUSTERS bust out their own high-energy danceable blend of American roots juke-joint rhythms and soulful blues! Led by dynamo Paula Bradley ("Miss Paula"), described as "Patsy Cline meets Bessie Smith" on lead vocals and piano; with the inimitable Peter "Dr. Z" Zarkadas on electric guitar (Sarah Levecque Band, Raw Symphony); and rhythm masters Brian Rost on upright bass (Tarbox Ramblers, Girl Howdy) and former Nashville drummer Kathy Burkly (Girls Night Out). The TWANGBUSTERS mix the best of bluesy country, boogie woogie, barrelhouse into a musical cocktail, shaken and stirred. Guaranteed to make you move yer feet! BOTTOMS UP! DJ EASY ED is the man behind “Easy Ed’s Variety Hour” on WMFO in Medford, MA (airing alternate Fridays from 6:00 to 8:00 PM Eastern — visitwww.easy-ed.net for details), spinning rockabilly, hillbilly, and ‘50s and early ‘60s rock ‘n’ roll and R&B. 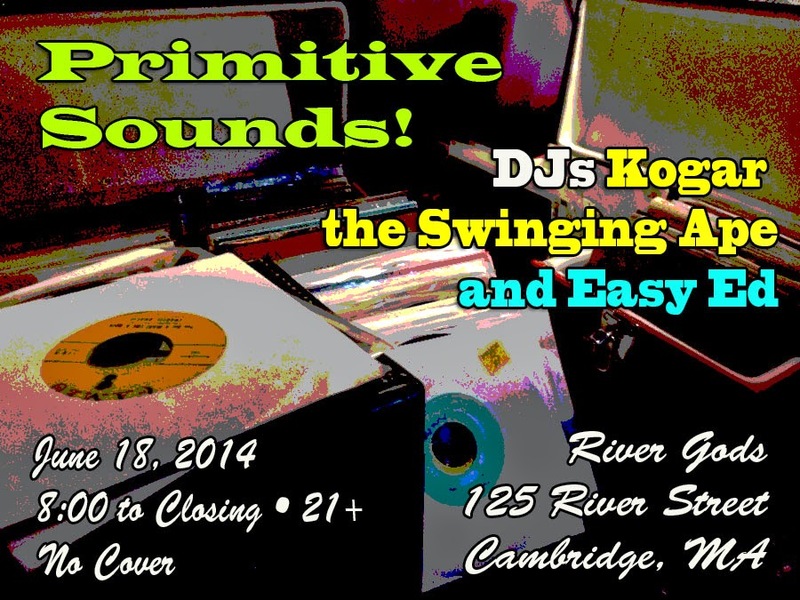 He also hosts the Primitive Sounds DJ night at River Gods in Cambridge, MA; spins records live at other clubs; and promotes rockabilly and rock ‘n’ roll events throughout the Boston area. He specializes in dance-friendly 45s for folks who love to move their feet. DANCE TEACHER SUE HUPPE has been two-stepping for many years. She can often be seen at music festivals and wherever you find great live music. An excellent dancer, she often teaches with her old pal, ROGER WEISS (who lives to two-step) and has been doing it for more years than he cares to tell. Together they give an enjoyable, easy-to-understand lesson in basic Texas Two-Step that will have you dancing like experts (almost) when the bands start to play. 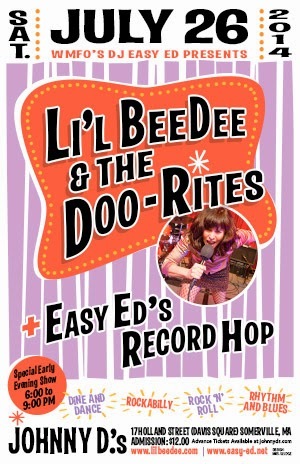 Join us on July 26 for a special early show featuring two generous sets by rockin' dynamo Li'l BeeDee and her red hot, never-wrong Doo-Rites. 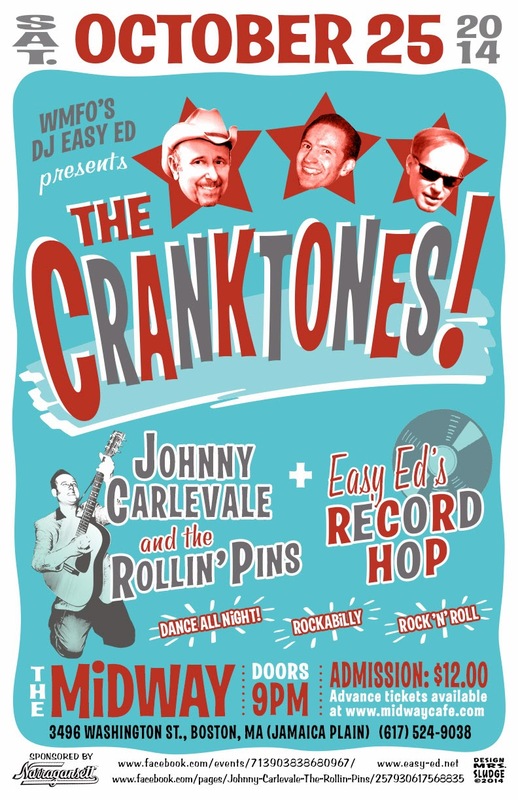 Dance the night away to their superb rock 'n' roll and vintage R&B styles. 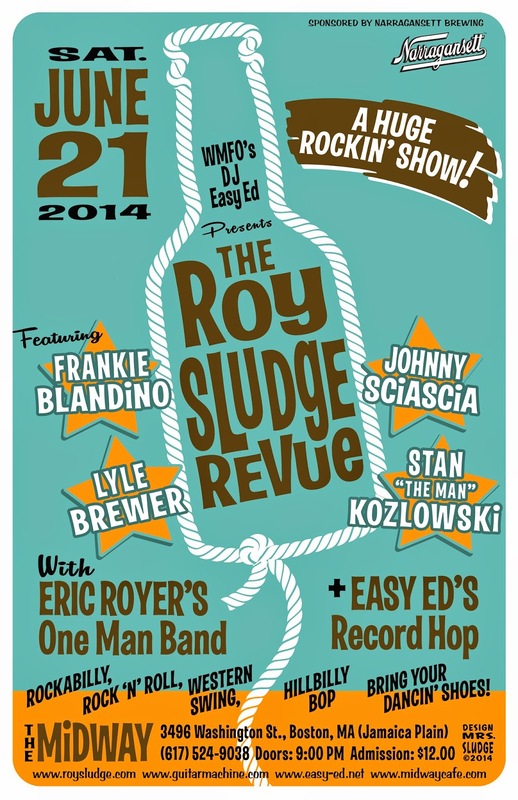 WMFO's DJ Easy Ed will be on hand spinning records early and on the band break. All in all this will be an evening of nonstop rockin' sounds for your dancing and listening enjoyment. Don't miss it! See the Facebook event page for more details. See you there! '50s R&B and rock 'n' roll! 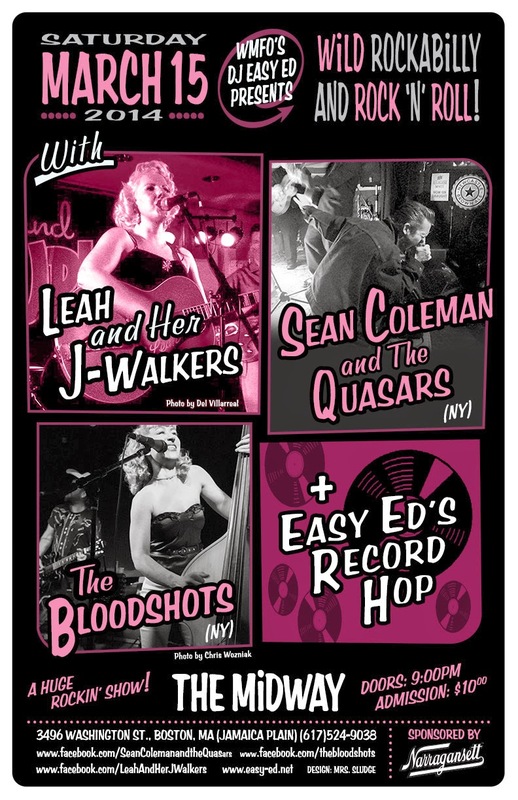 March 15, 2014: WMFO’s DJ Easy Ed Presents Sean Coleman and the Quasars, The Bloodshots, Leah and Her J-Walkers--Rockabilly and Rock ‘n’ Roll at the Midway! One night only! Sean Coleman—lead singer of legendary Boston bands The Bourbonaires and The Swinedells—brings his new band, The Quasars, in from NYC for a wild night of rockabilly and rock ‘n’ roll. He’s part Little Richard, part Billy Lee Riley, yet 100 percent himself—and he’ll knock you flat with a high energy performance you don’t want to miss! The Bloodshots (NYC) gave a standout performance at the New England Shake-Up festival in Sturbridge, MA, last September. On March 15 they will be hitting Boston to celebrate the release of their “On Fire” CD, which features roots-rock, rockabilly, and hard-driving, traditional rock ‘n’ roll. We’re thrilled to have them back in New England for this special event. Leah and Her J-Walkers put their own unique spin on classic country, rockabilly, and rock ‘n’ roll songs. Their eagerly awaited debut record will be available soon, and features several outstanding original tunes. We’ll be welcoming them back to the Midway for another huge rockin’ show! 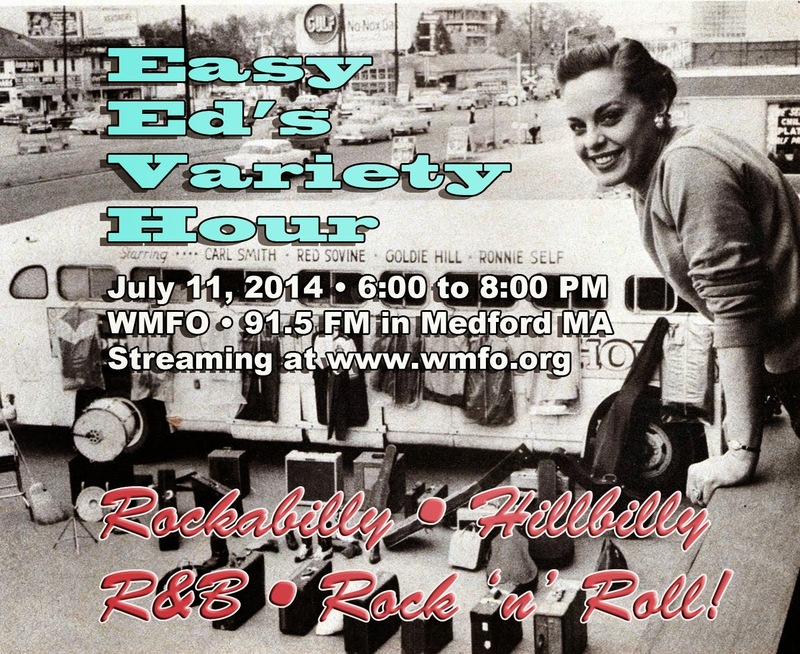 DJ Easy Ed is the man behind “Easy Ed’s Variety Hour” on WMFO in Medford, MA (airing alternate Fridays from 6:00 to 8:00 PM Eastern—see www.easy-ed.net for details), spinning rockabilly, hillbilly, and ‘50s and early ‘60s rock ‘n’ roll and R&B. He specializes in dance-friendly 45s for folks who love to move their feet. Many thanks to the good folks at Narragansett Brewing for sponsoring this event.